“The Allegheny Valley Railroad was originally incorporated April 4, 1837 as the Pittsburgh, Kittanning and Warren Railroad. 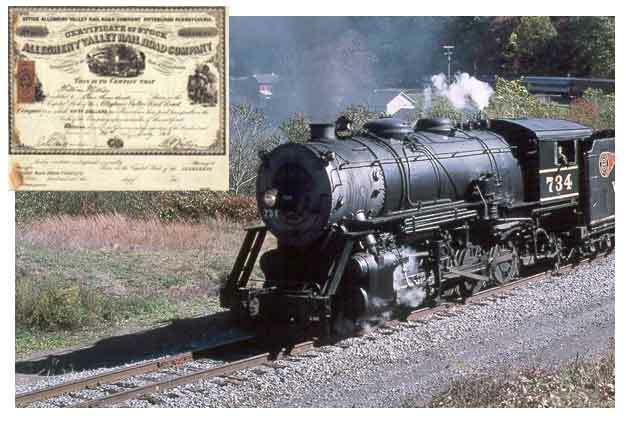 The name was changed in 1852 to the Allegheny Valley Railroad. The company having sold the required $100,000 worth of stock, was granted a patent through Felix Brunot, Esq. by the governor of Pennsylvania. Felix Brunot also served as one of the first directors of the railroad. The charter granted to the AVRR was one of the best obtained by any road in Pennsylvania. The road was immune from taxation until the dividends reached 12% and it was also granted perfect freedom in the choice of a route. The road was completed to Kittanning January 23, 1856 and the first train was greeted in Kittanning with great ceremony. The railroad proved to be a great convenience, but did not truly pay its own way until oil was discovered at Drake’s well and the road was extended to Oil City in 1870. The completion of the track to Kittanning gave great impetus to Verona. Four railroad stations were located within the borough limits: Iona, Verner, Edgewater and Hulton. (The name Verona is a combination of the names Verner and Iona.) The following additions and betterments to the railroad continued to help Verona grow. 1875 – New machine shop 112” x 215” with eight tracks entering the building from a transferable at Verona. 1876 – The engine house at Verona, containing 44 stalls converted into a shop for repairing passenger and freight cars. 1883 – Brass foundry fitted up at Verona shop. (1)Barr, H., Zaccaria, E., Reed, G., “A Verona Album, 1871-1971”, Verona Centennial Book Committee, 1971, page 5, The Allegheny Valley Railroad.